SUMMARY: Told in rhythmic free verse. Twelve-year old twins Josh and Jordan love basketball. They are smart and have a strong family to support them. But being 12 can be rough sometimes, and life seems to be driving the inseparable twins apart from each other. 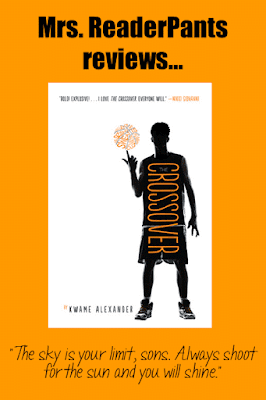 REVIEW: I read The Crossover in preparation for our recent Battle of the Books competition, where author Kwame Alexander was to be our special guest. I checked out this book from our library on two separate occasions, and both times, I was unable to read past p. 50 or so. I just wasn't interested in all the basketball. So when my Battle of the Books co-sponsor came to me raving about The Crossover, I tried one more time to give it a real chance. I gritted my teeth, determined to make it to the end. And finally, I was not disappointed. This book is a slice-of-life story. You have twin brothers, Josh and Jordan, who are clearly very close to each other. But when Jordan gets a girlfriend, the other twin Josh feels left behind. He kind of likes "Miss Sweet Tea" himself, and he feels like his brother is spending too much time pining over the girl. Underneath it all is a story about Josh and Jordan's family, both their relationship with each other and with their parents. If you are like me and having difficulty staying with this story, I urge you to hang in there. By the time the story is over, you will see why the hype is deserved. This is a unique, beautifully-written story that will especially appeal to middle school boys, particularly those who love basketball. Its free-verse, rhythmic text make it a great choice for reluctant readers or whole-class novels as well. By the way, our Kwame Alexander visit did not disappoint! He's a burst of energy and personality and kept the students engaged and smiling. Highly-recommended if you are looking for your library's next author visit. THE BOTTOM LINE: Massive praise for this book is deserved. If you are having a hard time getting into it, hang in there! It is so worth it in the end. STATUS IN MY LIBRARY: We have four copies. Kwame was only able to autograph one since the other three were checked out!